Researchers have found that people who are multilingual think faster and sharper. 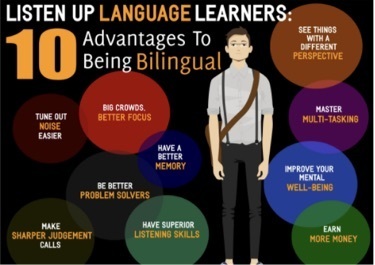 Not only this but also being bilingual makes people’s brain more efficient and combat cognitive aging. Bilingual people’s brain operates differently from single language speaker. They process information from other perspectives. Makes quite an impression, doesn’t it? In this scenario, we are quite lucky as our mother tongue is not English but English forms the basis of most of the aptitude test, official work. It is the language in which all of India communicates and as does the world. As a parent, our job is to ensure that we equip our wards with all the tools to make themselves. And being able to communicate in English is one such tool. As is the case with non-native tongue, learning a new language is a systematic and disciplined process. But it is worth the pain. And when one is younger, learning is easier as the mind is not bounded by priorities. It is not a means to an end but a part of the curriculum. Given the haste a grown-up has, one may miss the finer points of mastering the language. The benefits of learning English as a second language especially in the Indian context is huge. Some of them are enumerated below. Make new friends easily as language barrier is reduced. It is one of the six languages used in United Nations and more than 67 countries use this language either as a native language or official language. This makes it important as when a child grows up and wants to pursue education elsewhere it makes it easy for him/her. India is a diverse country with different dialect spoken throughout its geographical length and breadth. However, English is something the children learn as it is taught in most of the schools. This may be because of the fact that English is socially accepted as a language to learn even if resistance to learning different languages may exist. While people may say that Hindi is also used in most parts, this conception is not very true as only 40% of Indians speak English while it is considerably higher for English. This making it a language in which India communicates. Most of the higher education literature is available in English. Be it engineering, medical sciences, physics. Translations do exist but there is a dearth of such materials. Increased mental flexibility as the person doesn’t feel baffled when another language is used. Often in the films and serials, the characters at some point use English. How will a non-English speaker understand it? Read it from the subtitles below probably. But when their peers easily understand the language, it may make the individual feel left out. His/her confidence may be shaken. Our parent’s generation generally learned English from 8th standard, if they were taught, and then they really worked hard to master it. This was in addition to preparing for boards, competitive exams and mastering other subjects. This would have been so easier had they learned it before. And perhaps this is the reason why they wanted us to learn it as early as possible and learn it right. So there is a thrust on learning the grammar, the rules. Planet spark helps realize this by providing qualified teachers and study material in the vicinity of your home. This makes things easier to learn English in a more relaxed atmosphere and the course is more customised to the needs of the student rather than what comes next in the school’s curriculum.